There's another world beneath the ocean's surface. Come join us, as we explore The Depths Below. We know the Earth isn't flat – in any sense of the word. We see mountains – valleys – hills – and holes. 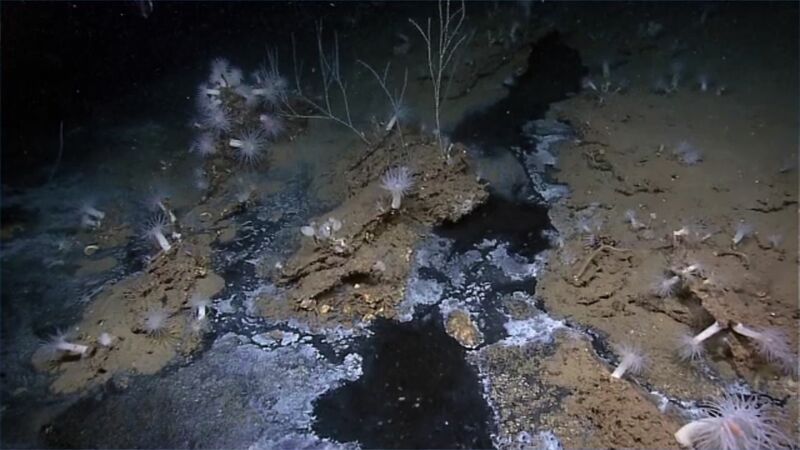 And the seafloor is just as diverse a landscape. But did you know that in certain places on the seafloor, like in the Gulf of Mexico, there are even underwater lakes and rivers? How is that possible? Well, these lakes and rivers form when seawater seeps up through thick layers of salt, which are present beneath the seafloor. As the water seeps up, it dissolves the salt layer, causing it to collapse and form depressions. The dissolved salt makes the water denser, and because it is denser than the water around it, it will settle into the depressions, forming a river or lake. These underwater lakes and rivers can be as small as a few feet across or as large as a few miles long. They're even very similar to lakes and rivers on land, with shorelines, surfaces – even waves! And there are even some creatures that enjoy hanging out by these lakes, like underwater beach bums. Huge fields of mussels are found growing along the edges of some of these lakes – but they're not exactly sunning themselves. This far beneath the ocean's surface, sunlight is extremely hard to come by. As we know, sunlight plays an extremely important part in the food chain here on land. But this far down, organisms like these mussels have adaptations that allow them to get their nutrients from bacteria that can convert methane and other chemicals in the salty water into energy. While we've come a long way in our understanding of the ocean, most places are still unexplored, and many questions are unanswered. So join us as we explore The Depths Below.